José Mourinho was strongly criticized for United's negative performance following their 0-0 draw against Sevilla last week. While perception of the result was partly coloured by Liverpool's three-goal haul at the Ramón Sánchez Pizjuán stadium during the group stage, the general consensus is that United may come to regret their lack of ambition in pursuing an away goal. A goalless first leg leaves a European tie precariously balanced. In the decisive second match, one team has the advantage of playing at home. The other team, however, has the advantage of the away goals rule: any scoring draw will guarantee them a place in the next round. Unless United build up a healthy lead, Old Trafford will be very nervy place on the 13th March. The advantage of playing at home has undeniably declined over the decades. In the 70's and 80's, the home team in European competitions would win 60% of matches; in the last 10 years this has declined to 47% (irrespective of whether you include or omit group-stage matches). But is the decline of home advantage significant enough to render a 0-0 draw away in the first leg a bad result? The plot below shows the proportion of European ties in which, following a 0-0 draw in the first leg, the home team in the second leg emerged victorious and proceeded to the next round. The results are aggregated by decade: the black horizontal line shows the proportion of home team victories (in the second leg) during that decade; the dark and light blue regions indicate the 68% and 95% confidence intervals. Figure 1: The proportion of European knock-out ties won by the home team in the second leg following a 0-0 result in the first leg. Results are measured by decade: the horizontal black lines show the proportion in that decade, the dark and light blue regions indicate the 68% and 95% confidence intervals. During the 1970's the home team in the second leg won nearly 75% of ties that ended 0-0 in the first leg. 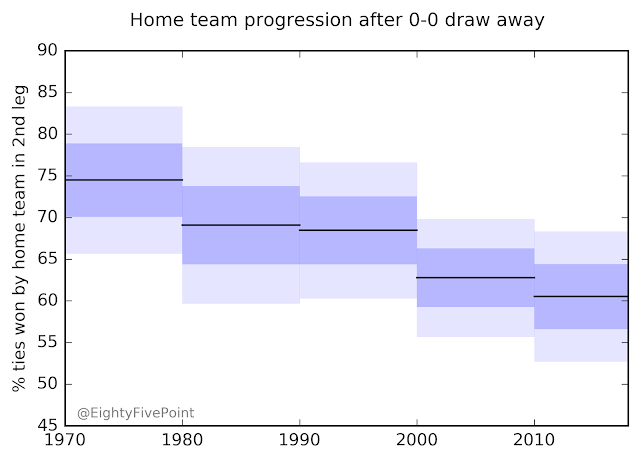 This proportion has clearly fallen since, mirroring the general decline in home advantage: in the last seven seasons the home team has progressed in only 60% of ties. In betting terms, the odds of the home team failing to progress following a 0-0 draw away have narrowed from roughly 3-1 forty years ago, to 3-2 today. These results imply that United are still favourites, but not by much. Mourinho's reluctance to go for an away goal represents sizeable gamble. It's also not a sustainable strategy: no club has reached the final of the Champion's League having failed to score an away goal in the preceding knock-out rounds since Ajax in 1995. 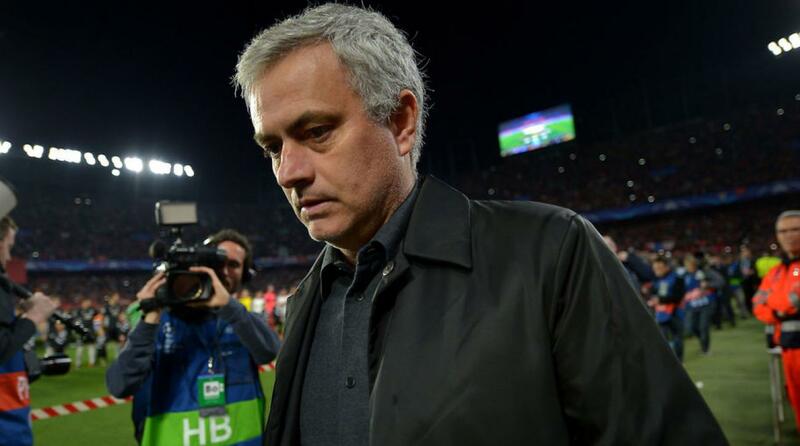 So, while Mourinho may emerge victorious in two weeks' time, he should not feel vindicated – there are only so many times you can play Russian roulette with the away goals rule. It it time to ditch the away goals rule? The away goals rule was originally brought in by UEFA in the 1960's to break ties in the aggregate scoreline over two legs, however it has since become better known as an incentive for the away team to attack. Back in the 60's and 70's, playing at home provided more of an advantage than it does now. Consequently, the away team would dig in, hope to keep the score down and plan to wreak revenge in the comfort of their home stadium. By increasing the value of away goals UEFA encouraged the away team to come out of their shell: after all, a 3-1 defeat was now better than a 2-0 defeat. 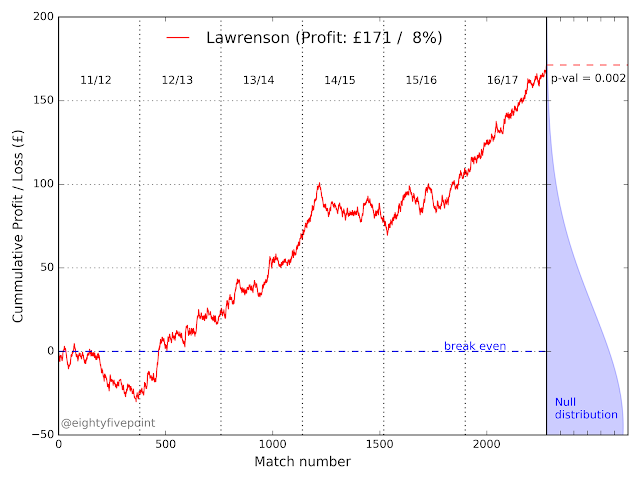 However, as this plot demonstrates, home advantage appears to have steadily declined over the last fifty years. The proportion of matches won by the away team has increased significantly as foreign matches have become less of a journey into the unknown and players are vastly more experienced in playing outside their country of birth. If home advantage has become less important then has the away goals rule become unnecessary? Furthermore, in the context of a 0-0 result in the first leg, the rule arguably acts contrary to its underlying purpose. What is the incentive for United, a naturally cautious team under Mourinho, to aggressively chase a goal at Old Trafford? Doing so may leave them vulnerable on the counter-attack; conceding just one goal means that United then have to score two against a team who will play even more defensively. Presumably Mourinho will aim to control the game, monopolize possession and hope that United can build a two goal lead. If they succeed, he will then shut the game down. Equally, there is an incentive for Sevilla to play defensively. The longer the game progresses at 0-0, the edgier the crowd become, the nervier United become, and the greater the psychological advantage to the away team. Set pieces around the United goal would become increasingly difficult for them to defend. So we are left with two teams, neither with an overriding incentive to attack: logic dictates that both United and Sevilla are likely to adopt a conservative approach. In this situation, the away goals rule has acted contrary to its innate purpose and encouraged more defensive football. You can't help wonder whether, in its absence, the second leg at Old Trafford might be a more exciting prospect. Thanks to David Shaw for comments and edits. Ties decided by penalties were excluded; including them would not change any of the results.